Corrected 19 February 2019: Appendix tables 1 and 4 were corrected. The corrections are indicated in red. The current account showed a deficit of EUR 0.5 billion in December. The value of goods exports in balance of payments terms grew by 4 per cent from twelve months back. There was net capital outflow from Finland. The data appear from Statistics Finland's statistics on balance of payments and international investment position. The current account was EUR 0.5 billion in deficit in December. The 12-month moving total of the current account was EUR 3.8 billion in deficit. 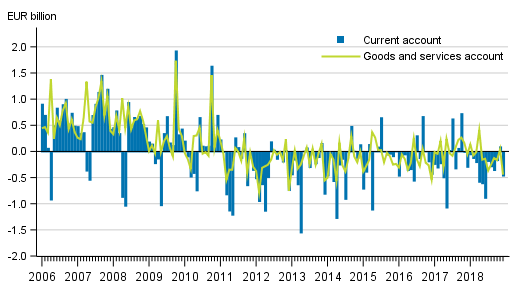 Of the sub-items of the current account, the trade account in balance of payments terms was EUR 0.2 billion in deficit. 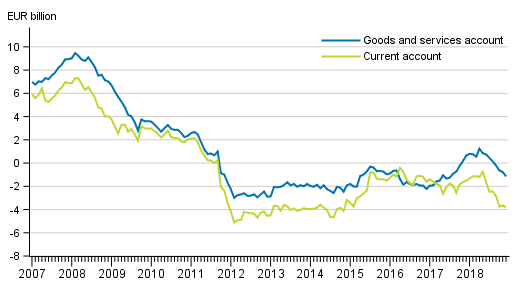 The value of goods exports in balance of payments terms grew by 4 per cent year-on-year and totalled EUR 4.8 billion. The value of goods imports in balance of payments terms grew by 7 per cent from twelve months back. The service account showed a deficit of EUR 0.2 billion. The primary income account was EUR 0.2 billion in surplus. The primary income account includes investment income like interests and dividends. The secondary income account was EUR 0.2 billion in deficit. In December, net capital outflow from Finland amounted to EUR 6.4 billion. Of the sub-items of the financial account, net capital inflow was mostly in the form of portfolio investments, EUR 6.9 billion. Net capital outflow from Finland was mainly in the form of other investments, EUR 14.4 billion. ISSN=2342-348X. December 2018. Helsinki: Statistics Finland [referred: 25.4.2019].